Russian educator and author; born at Kopyl, government of Minsk, 1840. He received a fair education, including the study of the Bible with Mendelssohn's translation, Hebrew grammar, Talmud, and secular literature. In 1863 he entered the rabbinical school of Jitomir, where he studied until 1865; he wasthen transferred to the rabbinical school of Wilna, from which he graduated in 1867. In 1868 he was appointed teacher at the government Jewish school at Zakroczyn, government of Warsaw; and in 1870 he became principal of the government Jewish school of Plotzk, government of Suwalki. He was also instructor in the Jewish religion at the gymnasium in the latter town, where he still (1904) resides. 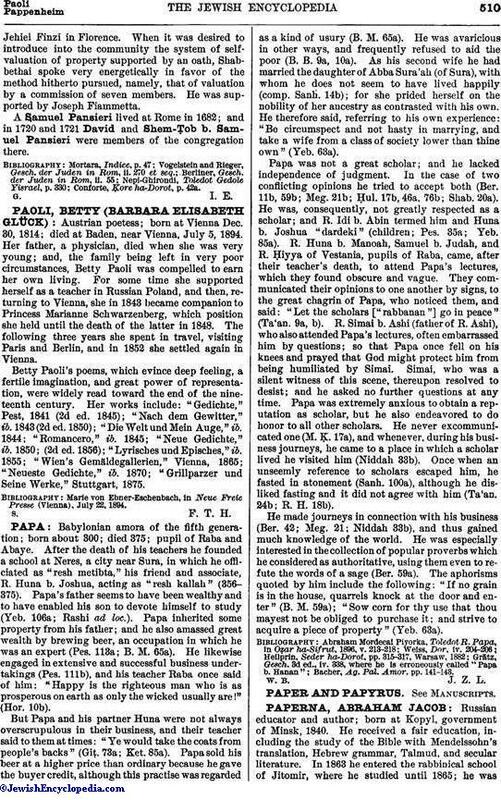 Paperna was intimately connected with the Russian Haskalah movement in the last quarter of the nineteenth century, and contributed various books and articles to Russian as well as to Hebrew literature. His first Hebrew poem, "Emet we-Emunah," appeared in "Ha-Karmel" in 1863; and since then Paperna has been a constant contributor to that periodical as well as to" Ha-Meliẓ." Critical articles by him, entitled "Ḳanḳan Ḥadash Male Yashan" (in "Ha-Karmel," 1867, and printed separately, Wilna, 1868), attracted wide attention in the circles of the Maskilim. In these articles Paperna, influenced probably by the Russian critic Pisarev, adopted modern realistic methods of criticism. He exposed the worthlessness of the pseudo-classicism in Hebrew literature, and the absurdity of the "guess-philology," in the commentaries on the Bible and the Talmud. He also ridiculed the presumption of some of the young Maskilim, who from a desire for fame attempted to write books in Hebrew on botany, astronomy, and the other exact sciences, with which they were entirely unfamiliar. A curious essay on the drama entitled "Ha-Drama bi-Kelal we-ha-'Ibrit bi-Peraṭ" appeared as a supplement to "Ha-Meliẓ," 1868. It called forth harsh criticism from A. B. Lewinsohn in his pamphlet "Tokaḥti la-Beḳarim," written under the pseudonym "S. Friedman" (Paperna had attacked Lebensohn's "Emet we-Emunah"), and from J. Steinberg ("'En Mishpaṭ"). 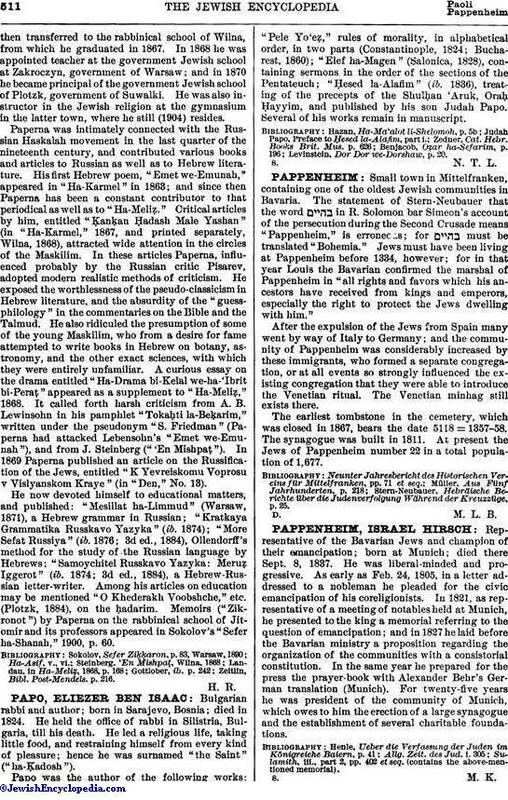 In 1869 Paperna published an article on the Russification of the Jews, entitled "K Yevreiskomu Voprosu v Vislyanskom Kraye" (in "Den," No. 13). He now devoted himself to educational matters, and published: "Mesillat ha-Limmud" (Warsaw, 1871), a Hebrew grammar in Russian; "Kratkaya Grammatika Russkavo Yazyka" (ib. 1874); "More Sefat Russiya" (ib. 1876; 3d ed., 1884), Ollendorff's method for the study of the Russian language by Hebrews; "Samoychitel Russkavo Yazyka: Meruẓ Iggerot" (ib. 1874; 3d ed., 1884), a Hebrew-Russian letter-writer. Among his articles on education may be mentioned "O Khederakh Voobshche," etc. (Plotzk, 1884), on the ḥadarim. Memoirs ("Zikronot") by Paperna on the rabbinical school of Jitomir and its professors appeared in Sokolov's "Sefer ha-Shanah," 1900, p. 60. Zeitlin, Bibl. Post-Mendels, p. 216.